After coming back from our short vacation, a few weeks back, vegetable box in my frige had 1/2 raddish, 1/2 turnip, 1 tomato, 1 onion and 2 potato. I made this curry with these vegetables and it came out really well. Here is the recipe. Take a wide pan, pre heat oil, add mustard seeds, cumin seeds, curry leaves and red chillies and fry it till golden brown. Now add onion first and saute it for a minute. 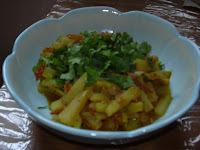 Add raddish, turnip, potato and tomato one by one and mix everything well. Add required amount of water. Also add turmeric powder and salt and let it cook for 15 mts. Raddish and turnip might take longer to cook than all the other vegetables. Now add garam masala powder and mix it well. Let it cook for another 5 mts. When water is fully absorbed and all the vegetables are fully cooked, turn off the stove and garnish it with coriander leaves. I am going to try this out today itself (I have all the ingredients-luckily)but minus the radish and turnip. I could almost smell your kitchen. Aahh the aroma. Imagining it makes me super hungry. I also cook with lots of herbs and spices. Cumin, freshly milled black pepper, curry... I love curry with shrimps and loads of red chillies bathed and cooked in coconut milk.